Mediterranean Chronicle is an international refereed journal, working under the aegis of Ionian University. MC will be published provisionally as one volume per year. Contributions are welcome in one of the following languages: Italian, Greek, French, English or Spanish. All articles should be accompanied by an abstract of about 200 words in English. reviews represent the personal views of the author. Brian Catlos: Who Was Philip of Mahdia and Why Did He Have to Die? Benedetto Vetere: Otranto, San Cataldo e Brindisi. Gallipoli e Taranto. 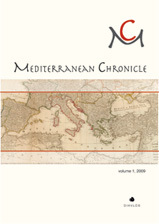 Mediterranean Chronicle (MC) is a new journal open to all subjects related to the humanities, ranging from the precursors and beginnings of the Greco-Roman and other cultures developed in the Mediterranean, to the impact and perception of those cultures in the modern Mediterranean world and the Western civilization in general. MC is published under the aegis of the Ionian University and with the generous support of “Diavlos Publications”, which hosts this ambitious initiative in a period extremely difficult for efforts of this kind. MC is the fruit of discussions and bonds of friendship and scientific collaboration among the members of the editorial board, who come from various universities, mainly European (especially Italian and Greek), but also American and Japanese. focusing on Mediterranean culture, but also in terms of the support of this initiative, when time came to pass from ideas and thoughts into action. Special credit for their support, ideas and suggestions should also be recognized to our friends, prof. N. Gonis, prof. Arnd Kerkhecker and dr. Ilias Yarenis. literature –fields in which all influences coexist and are incorporated in a uniquely harmonious way. In this spirit the seat of MC symbolizes the variety of tendencies that the journal hopes to express. The members of the editorial board, representing a variety of fields, tendencies, methodologies and ways of thinking, co-shape the physiognomy and targets of MC and guarantee the interdisciplinary character and quality of its publications, which is additionally secured by a wide net of reviewers according to the topic of the contributions accepted. notes concerning books, reviews and presentations related to the Mediterranean world are also welcome. relative to the topic of the journal will be available as well as “calls for papers” for conferences around the world. colleagues is a conditio sine qua non for the diffusion and the development of Mediterranean Chronicle. The editors and the editorial board are open to any suggestion that would contribute to the further improvement of this initiative, the widening of its perspective, and the success of our goals. In the present volume contributions are presented in chronological order, starting from prehistoric Antiquity and reaching Early Modern times. of different perishable materials not only in the Minoan culture but also in Mycenaean palaces. poetic dilemma between his epic ambitions and Hesiodian–Callimachean poetics. Ausonius was nominally a Christian, although his works reveal many pagan beliefs. Polimerakis refers to certain poems by Ausonius that testify distinctly to his Christianity, concluding that Ausonius remained faithful to his pagan education and was one who hovered on the borderland which separated the new religion from the old. Philip's identity along with the king¶s policies regarding Muslims as well as cultural exchanges and influences in the Mediterranean during that period. models, artisans and artists who worked in the Sicilian ambit and found the new dynamic center of this period¶s artistic production at the Norman Court. the contradictions of other more partial approaches. popular and the scholarly, the official and the alternative. 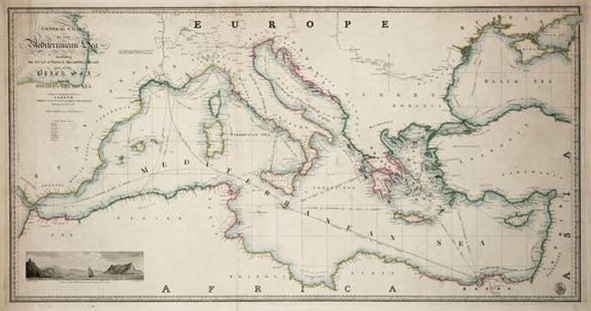 centers of Salento in the trade routes leading to the Dalmatian coast and the Eastern Mediterranean, as well as the nature of the commercial activities in those centers in the Middle Ages. admits at the same time that the nature of the sources itself poses limits to conclusions, as they belong to periods with big chronological gaps in between. In her article “Artigianato e commercio a Girona (1442-1453)” Sandra Bernato examines the intense commercial activity at Girona during the 15th century, and the preparation for the city¶s entrance to the wider development of Catalan economy, which would happen after 1454. Πολύπτυχον, Homenaje a Ioannis Hassiotis – Αφιέρωμα στον Ιωάννη Χασιώτη.